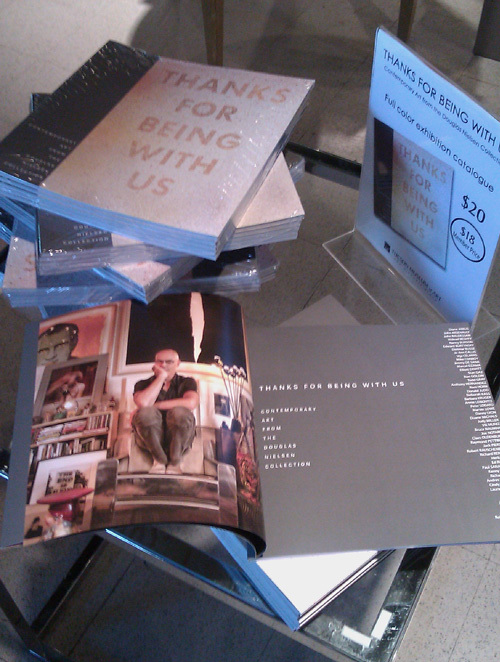 A high point of my recent trip to Tucson Museum of Art (TMA), to see the opening of Thanks for Being with Us: Contemporary Art from the Douglas Nielsen Collection, was picking up the exhibition’s impressive catalog in the museum’s bookstore. This is a very thoughtfully produced volume, and I credit TMA Chief Curator Julie Sasse for leading the effort to produce it. Likewise, I thank those who generously provided financial support to publish the catalog. Turning the corner into the bookstore and seeing the stack of catalogs (above) was an amazing feeling — an experience I shall not forget. I was so happy to see Doug Nielsen — the collector who made the exhibition possible — photographed among his works in his Tucson loft. What’s more, to see my painting between the covers made me think about what it was like when I first started painting, so many years ago. I never had any intention of showing my work, let alone in a museum, or be shown in a museum catalog between Andy Warhol and Joel-Peter Witkin! Sasse: Some of the artists are already famous when you get them and others are emerging. Does that give you a feeling of satisfaction that you might be nurturing some new talent? Nielsen: Oh it’s always nice. Like Grant Wiggins and Vonn Sumner have current shows in California, and I’m happy to hear it, because I know how hard they work. You know, an artist works primarily alone in the studio. I’m with dancers all the time. 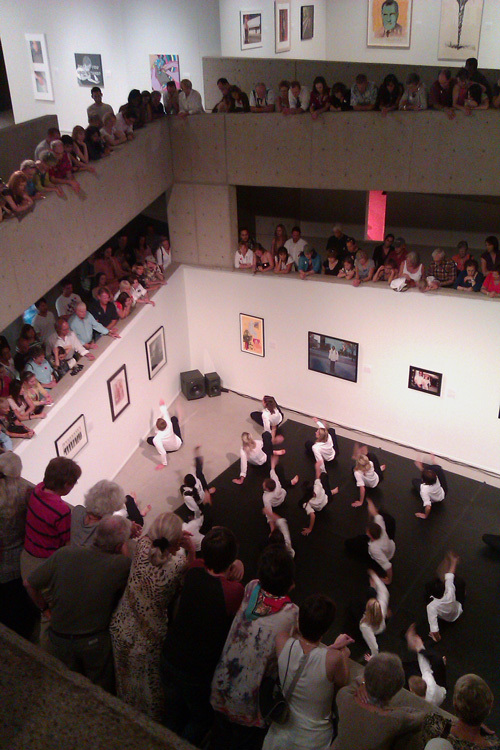 Choreographers need people; artists need paint. You know it’s very different; it’s almost anti-social, like writing. It’s between you and the canvas or you and the page. And I always think how isolating it must be to be by yourself, and then have to bring everything out and put it on the wall. It’s like your guts, it’s like your whole psyche is being exposed. Nielsen makes a very perceptive point — one I had not given much thought before. Painting can be really anti-social! In fact, you need to be anti-social — to tune everything out, and shut yourself in — to be able to have the focus to get it right. While maintaining an inward focus is imperative to painting, it’s also very difficult to coax myself out of that anti-social purview, so that I can participate in the world around me. I haven’t put much thought into it, but, now that I think about it, shifting between private and public spheres can be very challenging. 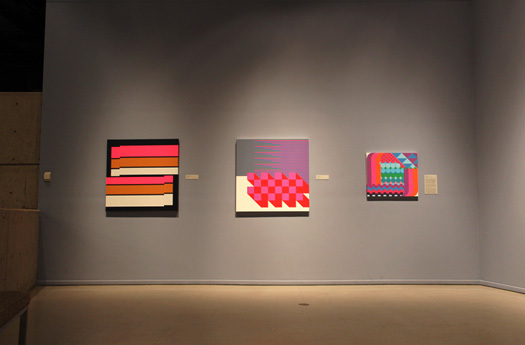 Thanks for Being with Us: Contemporary Art from the Douglas Nielsen Collection will be on display at Tucson Museum of Art through October 10, 2010. Take some time to check it out if you can. 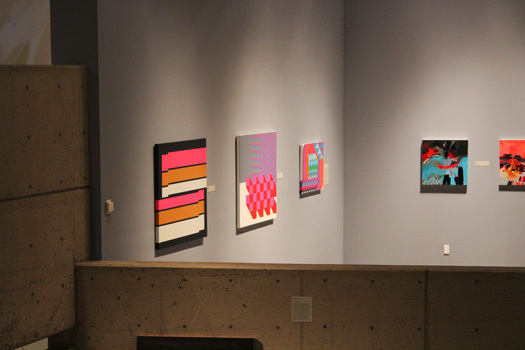 On Friday evening Tucson Museum of Arts hosted the opening of Thanks for Being with Us: Contemporary Art from the Douglas Nielsen Collection. I was there to celebrate the occasion, and to congratulate Doug Nielsen, a University of Arizona dance professor who owns two of my paintings. In this exhibition I am showing Hands, a 2004 acrylic-on-canvas painting that represents the beginning of the end of my early neo-pop art style. 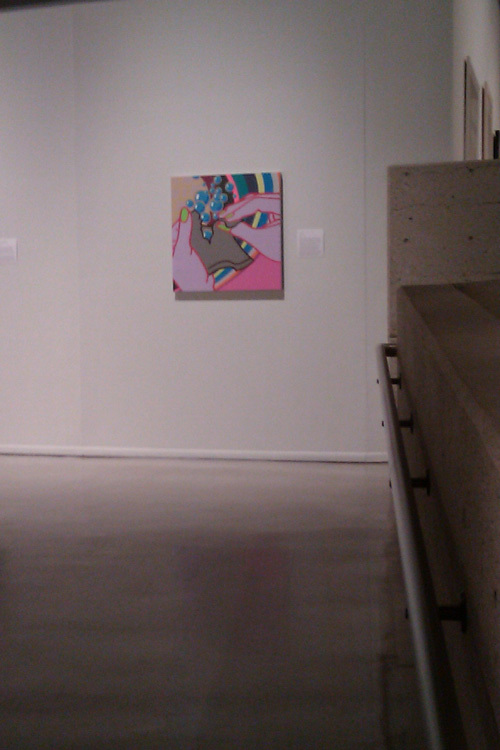 Overall, 75 artists are in this show, which will be on view at Tucson Museum of art through October 10, 2010. To be showing my work among legends of contemporary art — John Baldessari, Annie Leibovitz, Raymond Pettybon, Ed Ruscha, Cindy Sherman, and Andy Warhol — was a remarkable feeling. To see one of my paintings in the same catalog as these artists was an utterly amazing, as well. As I left the museum, I felt as if I had turned a corner in my life as an artist. I felt as if I had made it. I could “hang with the gang,” so to speak. A torch-bearing angry mob, chanting “Take it down!” never appeared next to my painting. I am proud to call Nielsen one of my collectors. He is a straightforward, genuine and generous person. What’s more, his philosophy on collecting art is equally genuine: He buys what he enjoys seeing. He’s the furthest remove from those who collect art based on perceived value. He’s a true collector. I also thank Shawn Miller, also a collector of my art, for his generosity in making the exhibition catalog possible. Postscript, August 8, 2010: Please take a moment to view this video profile of Doug Nielsen, produced by the University of Arizona. Postscript, August 25, 2010: An interview with Doug Nielsen by the University of Arizona’s student newspaper, the Arizona Daily Wildcat.